Driving slowly along a quiet neighborhood street in Newton recently, it didn’t take long for Bob Ackley to spot signs of what he said is a natural-gas leak killing a roadside tree. Amid the lush green front lawns along the 100 block of McCarthy Road, Ackley points to a large patch around a small tree where no grass is growing, and to the tree’s bare upper branches. Ackley, a cofounder of the Massachusetts Shade Tree Trust, said natural gas leaking from an underground pipe is pushing oxygen out of the soil and killing the grass and the roots of the tree. The damaged spot is one of 350 that he said he’s found in Newton since beginning a survey in November, and by the time he’s finished, Ackley said, he expects to find about $1 million worth of damage caused by leaking gas lines. While larger leaks are repaired immediately, Ackley said, utilities often don’t bother to fix the smaller ones, and his organization wants them to replace the trees that die as a result. Newton and Brookline are among nine Eastern Massachusetts communi ties — joining Hingham, Lynn, Milton, Nahant, Quincy, Revere, and Saugus — that have signed on with the Shade Tree Trust to search for trees damaged by gas leaks, he said. The leaks are often caused by aging and corroding pipes, and small gaps at their joints. After assessing the damage, the trust works with the communities to seek reimbursement from National Grid and other gas utility companies. The trust was cofounded by Jan Schlichtmann, a Beverly lawyer made famous by the movie “A Civil Action,’’ starring John Travolta, that chronicled Schlichtmann’s legal battle against companies accused of leaking contaminants into drinking wells in Woburn. However, a National Grid spokesman, David Graves, said that the trust’s claims of natural gas leaks damaging trees are highly inflated, with no data to support its contentions. He said most of the damage to trees is done by disease, insects, restricted root growth, road salt, and cars. Natural gas can damage a tree, he said, but when it does, National Grid replaces the tree. “It’s our position that the trust has grossly overestimated the damage done to trees by natural gas exposure,’’ Graves said. In Brookline, where the Shade Tree Trust reported finding $1.1 million in damage to trees on public property, the town has started working to recover the money from National Grid. Brookline’s tree warden, Tom Brady, said he was surprised by the extent of the damage Ackley discovered in town during his 14-month survey, which he finished in December. 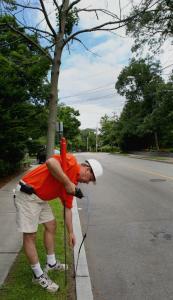 Ackley said he found 273 leaks in Brookline affecting 518 trees. In some instances, including a leak on Beverly Road in front of the Baker School, the town had removed one dead tree, and its replacement also died. “The slaughter of public shade trees that has gone on in Massachusetts the last 25-30 years is mind boggling,’’ he said. Graves said National Grid follows state and federal requirements for repairing gas leaks. He said serious leaks are repaired immediately, less severe leaks are scheduled for repairs, and the smallest leaks that are determined not to be a hazard are not repaired, but they are monitored. In Quincy, where Ackley estimated gas leaks caused more than $850,000 in damage to trees, City Council president Kevin Coughlin said he had begun to recognize the problem when his constituents reported smelling gas, and would then report damage to their trees. Coughlin said the trees are part of Quincy’s assets, and National Grid needs to repair its infrastructure and make cities and towns whole for any damage caused by gas leaks. “These are taxpayer dollars that fund the planting of these trees,’’ Coughlin said. Mark Welch, director of Newton’s Division of Urban Forestry, said the average cost of removing a dead tree is about $500, while a larger specimen can cost $2,000 to remove. Welch said budget concerns are preventing the city from planting new trees, because a new planting can often cost about $600. Welch said he’s expecting Ackley to complete his survey in Newton in the fall, and the city will decide whether to pursue damages from National Grid after receiving the trust’s report. In an urban community such as Brookline, Brady said, the value of a good shade tree can’t be measured simply by the cost of replacing it.